Lochaber Geopark has regular involvement with the local primary and secondary schools, providing talks, day trips and geology material. Each school has been provided with a “Rock Box” with rocks from different parts of Lochaber, a magnifying glass and notes on the rock types. A similar “Mineral Box” is planned which will travel from school to school together with accompanying descriptive notes and lesson plans. 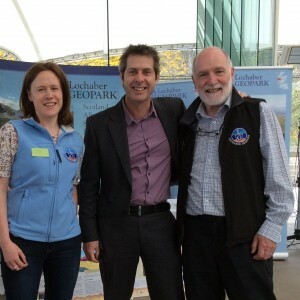 Lochaber Geopark endorse the Earth Science Education Scotland campaign. 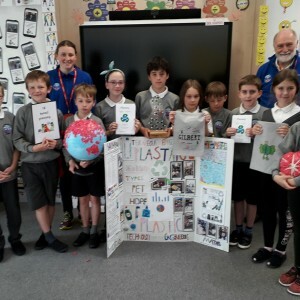 Their mission is “to promote Earth science education in Scottish schools, and in particular to campaign for new qualifications in Earth science in secondary schools”. In 2018 we were the main sponsor for the first ever Primary School Science Fair in Lochaber, with 18 local STEM (Science, Technology, Enigineering and Mathematic) businesses attending it was a great success. The children from the local schools were given workshops on topical science such as coding and current volcanic hazards. The projects for the science fair were presented to a panel of STEM experts and the winning school received the Sir James Black award. Bun-Sgoil Ghàidhlig Loch Abar, winners of Lochaber Primary STEM Fair Projects 2018. We regularly have schools visit us to learn about the local landscape, geology, tourism and STEM subjects. Research, by UCL Institute of Education’s Aspires Report, shows that engaging children, especially girls, with science at a young age, can have a positive and lasting impact on whether they pursue a STEM subject in the future. 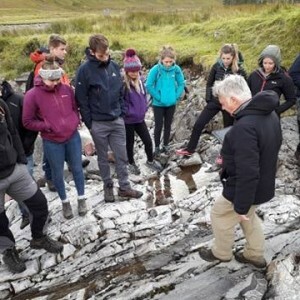 Lochaber Geopark runs an annual course on general geology, with a strong Lochaber slant, with much use of practical material. Highland Council’s Glen Nevis Rangers, Forestry Commission Rangers and members of outdoor pursuit companies and guides have all benefited from this course. Since the Geopark began we have been working with groups such as the U3A and the local geology group. In Winter we provide talks, March our local geology course which includes a field trip. We also provide local geology tours to places such as Glen Coe, Glen Roy and Ardnamurchan to see the best geology Lochaber has to offer. Lochaber Geopark regularly participate in Open Days in Lochaber and further afield to promote Lochaber and its scenery and geology. Open days have included events at Our Dynamic Earth, Edinburgh and British Geology Survey (BGS). UHI students learning about the parallel lines of Glen Roy (NNR) and underlying geology. We are lucky enough to have visitors from Universities internationally such as Wageningen University and also our local University UHI. We provide leaders for their excursions as well as have them in to visit our Visitor Centre. 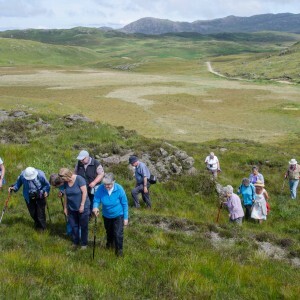 Jointly organised by Lochaber Geopark and Visit Scotland Strontian, the Geology Day is held each Summer. There are stalls and activities in Strontian village and organised tours of the Strontian Mines Area. Strontian Mines is an important part of the Lochaber geology and history. If you would like us to come to your school or take a group out for instance please contact us.